In sculpting Scott County Hospital, Health Facilities Group’s chief design goal was to create a functional space that evokes the unique spirit of its community. Often, an aesthetic vision begins with interviews and community engagement. At other times, however, HFG is privileged to fulfill a vision already perfectly articulated in the geologic beauty of a community’s landscape. Exploring Scott County before a preliminary design meeting, HFG’s design team found itself looking upon such a landmark. Several miles north of Scott City, a small river drains into a large reservoir. In the vicinity of El Quartelejo, the northernmost pueblo built by the Pueblo Native Americans, this river weaves through a wide canyon of its own making to create an environment wholly different than the area’s surrounding wheat fields. Raising the idea in the first design meeting of paying tribute to this site, HFG wasn’t surprised to learn that this locale had become central to Scott City’s sense of identity. HFG ultimately designed a towering 33-foot-tall atrium with an undulating ceiling flowing towards the community space of the hospital's cafe. Just as the sight of the region’s canyon walls propel the onlooker’s eyes towards the calmness of the lake basin, this design sweeps guests into an inviting and holistic environment. Natural design materials such as wood and stone further reinforce an association with the surrounding landscape. 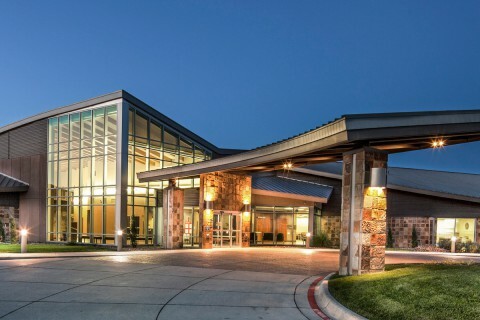 Reflecting on the hospital dedication ceremony, at which a presenter spoke of a deep connection to the river and canyon, HFG team members still remembered the satisfaction felt at having bolstered a community’s identity. After the citizens of Scott County, KS voted to pass one of the largest bond votes in the county’s history, Health Facilities Group was tasked with designing a 68,000 SF replacement facility for Scott County Hospital. Together with the facility’s well-received aesthetics, the hospital’s fulfillment of much needed services fueled twenty percent growth in services during its first two years. The new campus features a new medical/surgical unit with 22 patient beds, an emergency department, surgical suite, radiology services, a laboratory, labor and delivery suite, a provider clinic, a specialty clinic, a physical therapy space, meeting areas, and a dining facility.